Rarely does one comes across a celebrated artist who is as approachable as the winter sun, caressing the tuft of grass peeking from the sidewalk. Spinning the yarn of tales, one bestseller after the another, ardent dog lover Preeti Shenoy wears many hats. In this exclusive guest post for Dog with Blog she shares of her canine camaraderie. Any dog-lover will vouch that the world is sharply divided into two—those who love dogs and those who don’t understand the former. When I was travelling to the venue at a literature festival organised in Agra recently, I had a very interesting conversation with a fellow author and one of the organizers of the Lit-fest, both of whom are ‘non-dog-lovers’. They have both never had dogs, petted dogs or interacted with them. ‘Won’t it bite?’ asked one, as he had seen numerous pictures of mine with my Doberman. I wanted to correct him and say that firstly a dog is never an ‘it’. A dog is always a ‘he’ or a ‘she’. But I let that be, as most people who have no idea about dogs make this mistake. ‘No, she won’t bite. In fact if she bites you I will give you a million rupees,’ I said. ‘In that case I would happily get bitten,’ he said. ‘That is precisely my point. She will not bite unless I give her a command to ‘attack’. And if that happens, I can assure you, she will go for your neck and your life will matter more to you than the million bucks,’ I smiled as everyone laughed. The truth is,dogs can be trained to behave exactly how you want them to. It all boils down to the behaviour of the dog-owner. There really are no bad dogs—just incredibly stupid dog-owners who know no better. Dogs like the Doberman, German Shepherd and Rottweiler have been used as Military and Police dogs for many years now and have cracked hundreds of narcotic cases. They are also used as ‘Search and rescue’ dogs to locate suspects or missing people or objects. Dogs also assist the law enforcement agencies to detect illicit substances or drugs or explosives. Many dogs are also used as guide dogs for the blind. Dogs are also used in therapy for treating disability, illness, disease and trauma. Dogs have existed along with humans for thousands of centuries. In many cultures, dogs have been worshiped as a deity and a royal animal. Sadly, in some cultures, dog has also been maligned as ‘unclean’ and fear of dogs is instilled in people, right from childhood. It would probably be a concept alien to many Westerners. I have noticed so many people in India, are terrified of dogs. I wondered why, as I have always grown up with dogs. Why are some Indian/Pakistani people so afraid of dogs? I live in an area heavily populated by Indians and Pakistani residents, and whenever we take our dog out, they all cower away from him. A little background information, he’s a 12 week old puppy and weighs about 8 lbs. Is it something about the area that they are from that makes them afraid of dogs? I’m not being racist or stereotyping anyone (I mean I’m asian/white), but I’m just really really curious why they run away from a puppy?? I can imagine the puzzled bewilderment of the person who must have asked this question. In some 3rd World Countries the dogs are feral and wild, they run in the streets and they hurt people. Over time it has become a cultural thing to be scared of dogs you can because the dogs in their home countries are wild and mean. When the parents come over they imprint their children with this fear. For me, dogs are an embodiment of unconditional, selfless, pure love. Such love is impossible to get from humans. My dog is always beside me. Always. Even as I type this she is right next to me, at the foot of my bed. If I pause and go downstairs to make a cup of tea, she will follow me like a shadow, will wait till I brew my chai and then she will come back right upstairs with me, and she will do this even when she is in the middle of deep sleep! When I eat,she lies on the floor, between by legs, under the table. When I go for a shower, she waits outside the bathroom. When I am on the treadmill, she waits patiently, watching me. She understands my mood so perfectly that even though I am a seasoned dog owner, I am still moved. If I am feeling a bit low or under-weather, she will put her head in my lap to ‘comfort me’ or give me a huge lick to say ‘Don’t worry. It doesn’t matter’. When I work too much, she will close my lap-top with her paw and tug my T-shirt to take her out for a walk or a game of ‘fetch’. She has her own personality and she can be very naughty at times. She would want me to play with her and if I refuse, she knows precisely what to do—she will take my pen or my T-shirt from the wash in her mouth and she will stand and look at me with her ‘bait’ as though to say ‘Come on now. Come on! I know you want it!’ and I will be forced to follow her. She will then proceed to run faster than Usain Bolt around the Garden and I will do a close chase. Must admit that this workout is much more fun than the boring old treadmill! Having a dog is like having a child. In fact it is a lot harder than having a child—as children grow up and can do stuff for themselves after a while. Having a dog is a lot of hard work. You will be forced to wake up at 6.00 AM for the rest of your life. (or at least for the life-span of the dog). No matter how tired you are, you have to be up at the crack of dawn as your furry-companion has to be let out for their ‘morning business’. Having a dog makes you disciplined. It also makes you understand that it isn’t really that important to have your home in ‘perfect sparkling condition’ all the time. Having a dog, opens your heart in so many ways. Having a dog, brings unconditional love into your life. Having a dog, teaches you to live in the moment. 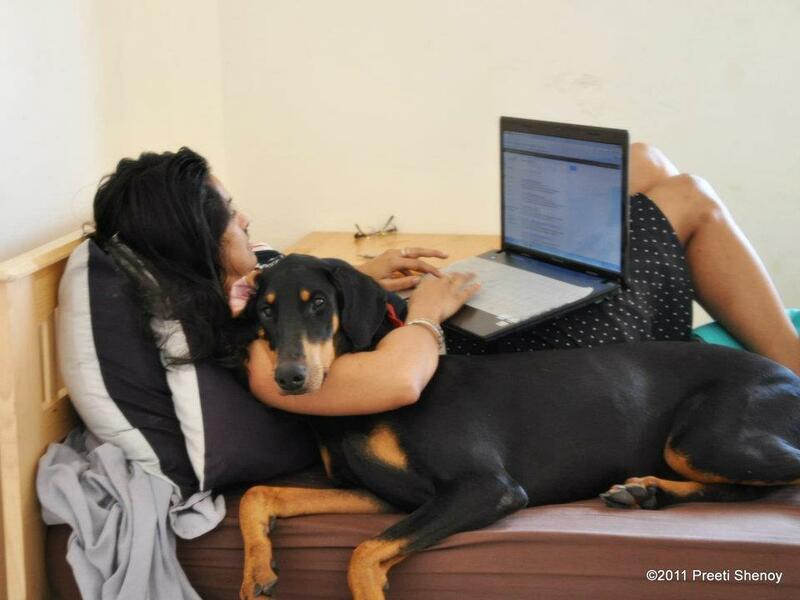 Woofs and words: Preeti Shenoy with her best friend ‘Lostris’. My dog has enriched my life in so many ways. As have countless dogs, all over the world, enriched the lives of those who have had them. Dogs do make the world a better place. Whatever you give a dog, you get back exponentially, multiplied to the power of infinity. Dogs have that much love to give. If only the same could be said of humans. Excellent piece. Covers all the facets of having a dog for a companion, in a style that’s compelling to read. Love the photo of the heads together! So much love and trust in the dog’s eyes. Every word you have said is 100% true! Hey Abhishek…Just happened to bump into your blog. Bhai kya zabardast ahe tujha !!. I congratulate you for such a wonderful blog dedicated to the kind which embodies kindness , loyalty ,endurance and all those virtues beyond the easy reach of any average man…Keep writing man. its so true what she said – having a dog is tougher than having a child! but i guess its worth the pain! still wondering when il be a proud owner! convincing all around me! WordPress suggested this blog. I might’ve ignored but the beautiful picture of the soopercyoot goggie next to the person with the laptop caught my eye. Aaawww!! !